Protests by farmers from the Ariège and the Aude disrupted the famous cycling race yesterday (Tuesday July 24), between Carcassonne and Bagnères-de-Luchon, with the 230km stage stopped for over 15 minutes as bales of hay, farmers and sheep blocked the roads. Riders were also allegedly sprayed in the eyes with tear gas (some reports called the substance "pepper spray") during the commotion. It was initially unclear whether the gas was used by protestors or police, but more recent reports suggest that only the police used spray. 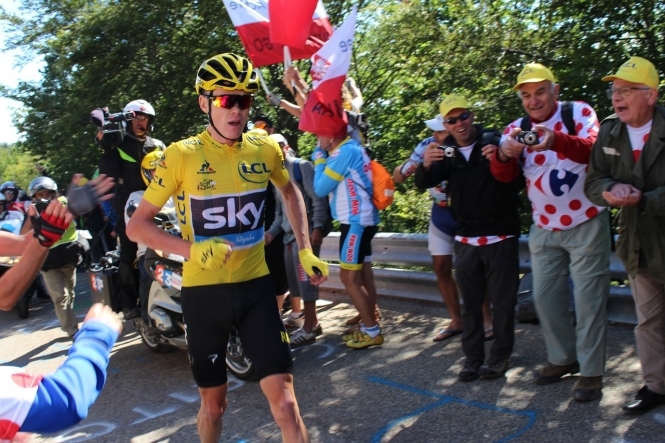 British rider Chris Froome, whose participation in this year’s race has been controversial due to a positive drug test for the banned substance salbutamol, was one of the riders affected by the gas. He was treated with eye drops and water at the scene. Now, farmers who staged at least some of the protests have said that they did not use pepper spray or tear gas, and were armed only with water bottles, hay bales, and sheep. He admitted that the protests had sought to disrupt the race, but not attack the riders individually. The farmers claim that their region has been unfairly kept as a “deprived zone”, and that they stand to lose €7,000-€8,000 in income as a result. Despite the race stoppage, the farmers say their protest was only partially successful, and accused the police of using damaging sprays. Mr Albert said: “There were around 200 sheep, tractors, and hay bales to disrupt the route. Unfortunately though, we got sprayed by the law enforcement, and they also sprayed the sheep. We were able to place some hay bales on the road, but that’s it. After the protests, the race continued, with Frenchman Julian Alaphilippe taking victory of the stage - his second this year so far. The short-but-challenging 65km 17th stage begins today, taking the riders from Bagnères-de-Luchon to Saint-Lary-Soulan, including many difficult ascents.